The blueprint for nationwide rallies on Sunday by opponents of ousted president Mohamed Morsi has been announced by the 30 June Front, led by the anti-Morsi Tamarod (Rebel) campaign. Responding to claims by Islamists that they are "defending the legitimacy" of democratically-elected president Mohamed Morsi, the anti-Morsi camp calls for mass demonstrations to "defend the people's legitimacy," as tension between rival factions over the dramatic removal of Morsi from the presidency heightens. Morsi was deposed by Egypt's Armed Forces on Wednesday following massive protests against his rule on 30 June, the anniversary of his first tumultuous year in office. Some international media, as well as the Muslim Brotherhood, labelled the military intervention a "coup," however anti-Morsi groups largely welcomed the army's move as a positive response to demands by at least 20 million Egyptians who protested on the streets – which greatly outnumbers Morsi's 13.2 million votes that landed him the presidency. Marches in Cairo, planned to kick off at 5pm on Sunday, will set out from Fatah Mosque in Cairo's Ramses district; the nearby Sayeda Zeinab Mosque; Mohandeseen district's Mostafa Mahmoud Square and Dawaran Shubra Square in the working-class Shubra Al-Kheima district towards Tahrir Square in downtown Cairo and the Ittihadiya presidential palace in Heliopolis - focal points of mass rallies that led to the overthrow of the Islamist president. Anti-Morsi groups warn of a US-Brotherhood plot to "occupy" their protest venues - namely Tahrir Square - the cradle of the 2011 revolution. In Egypt's second city of Alexandria, two marches are planned to converge at the Sidi Gaber Square - a site of many recent clashes. Marches are scheduled towards flashpoint squares in the pivotal city of Suez, which will meet in Al-Arbaeen Square, and the Nile Delta city of Mahala at Al-Shoun Square. 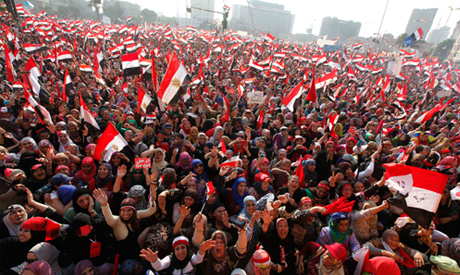 Provincial towns in Upper Egypt and the Nile Delta will see mass rallies converge outside governors' offices. Rival demonstrations by the former president's Islamist backers – a strong force in Upper Egypt - are planned in the same cities, heightening fears of more violent showdowns. Since president Morsi's ouster on Wednesday, street battles between rival factions have killed at least 37 people and injured more than 1,400. The Muslim Brotherhood-led National Alliance in Support of Legitimacy has called for mass nationwide rallies on Sunday to defend Morsi's "constitutional legitimacy." Thousands of Morsi supporters have already been camping out at Rabaa Al-Adawiya Mosque in Cairo for over a week with plans to continue. The Brotherhood propelled Morsi to power in last year's elections after operating underground for decades until Mubarak was ousted. More pro-Morsi demonstrations are planned in other focal points in Cairo, inducing the Presidential Guard Building and Nahda Square near Cairo University - a scene of fierce clashes between rival camps last week. it aint over till its over ! Isn't the "opposition" now the ones in power? Or are you admitting that Morsi is still the legitimate president?